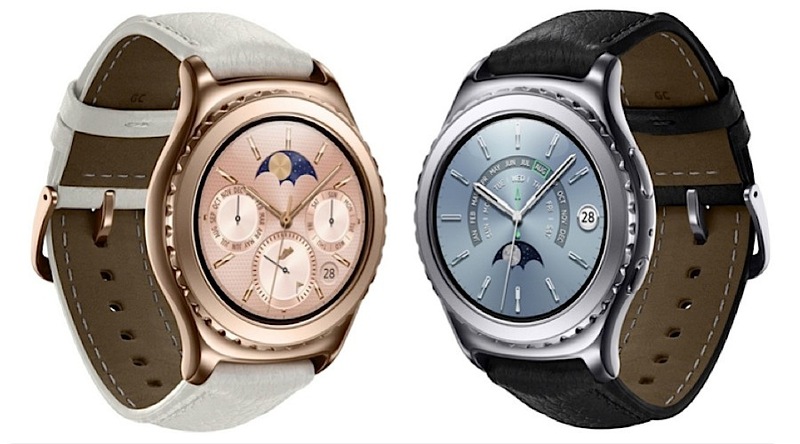 The Gear S2 classic, one encased in 18K Rose Gold and the other one in Platinum. For those who want a gold smart watch, but don’t want to spend the whooping $17,000 Apple is asking for its special-edition device, Samsung may have just what you need, as the Korean electronics company has launched its Gear S2 Classic. While the company did not unveil major details or pricing, The Verge reports that Samsung's 18K Rose Gold edition, as well as the Platinum one, are up for pre-orders in Europe for €480, or about $520. Beyond the price, however, there is another major difference between the two watches: while the Apple Watch Edition is a solid gold device, Samsung's S2 rose gold watch is just platted, which means it only has a layer of the precious metal on top of the Classic's stainless steel body. For a more personal and customizable experience, Samsung is expanding its line of watch straps and watch face options. The Gear S2 Classic launch also marks the release of new watch faces, which includes the famous Peanuts characters and artwork from prominent artists. More information on pricing information and availability will probably be provided by Samsung in February during the Galaxy S7 launch event.